« Video: What makes a swimmer efficient? A focus on Balance shows up virtually every day in one or more threads on the TI Discussion Forum. Today, in a thread titled Back to the Roots, Haschu reported: This morning I practiced in a 15-meter hotel pool. I watched Shinji’s video of holding Superman Glide for 12.5 m. I wondered how he could glide such a long distance and tried to match that. So I did SG repeats for about 20 minutes, finally reaching 10, perhaps even 12 m.
After that I did a few laps of fullstroke breathing to my left, which is my ‘bad’ breathing side. I’m deeper in the water and always lift my head when breathing left. I could never figure out why. I tried to adjust my right spearing arm and other things, but nothing seemed to work. Yet after that extended period of SG my my mouth was clear of water as I breathed. I find it quite amazing how much benefit one can gain from very ‘basic’ drills like SG and core balance. I can only encourage everybody to use those drills intensively. They make everything else so much easier. Once you’ve practiced TI for several years, most of your Kaizen – continuing improvement – opportunities will be rather subtle. You can swim as far as you like. 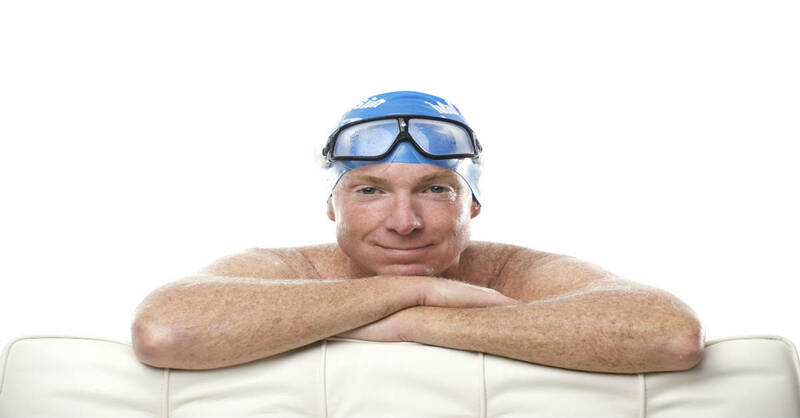 On the whole you feel pretty good when swimming – perhaps even experience Flow States at times. Yet – because you tirelessly seek small flaws to improve – you find them. 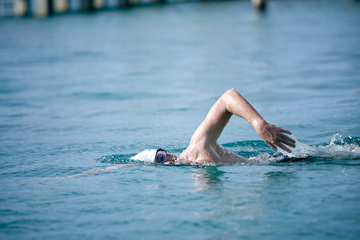 Your ‘symptom’ –feeling a bit lower in the water, and that you lift your head slightly when breathing to the left — is clearly balance-related. But it’s difficult to correct because (quoting Sting) every breath you take reinforces the error. If you analyze a bit, you realize: (1) lifting your head causes the ‘sinking feeling'; (2) it probably also means that your right hand is ‘bracing’ rather than extend-and-catch; and (3) all of this happens because you don’t feel as well supported as you roll to your left. Nothing deepens sense-of-support (and emotional security) like SG. As well, no drill is quite as good at helping you really, really, really release your head. At first just when looking down. It takes greater focus to keep really, really, really releasing your head as you roll to breathe. "Really, really, really relax your head" while breathing. One way is repeat SG until you feel yourself really, really, really releasing your head while gliding. Then add some strokes and really, really, really release your head while stroking. Finally take a few breaths to evaluate whether you’re still really, really, really releasing your head while breathing. I look for a feeling that the side of my head is floating on a cushion as I breathe. I don’t mind doing 20 minutes of very short, intensely-focused repeats in pursuit of it. As I’ve said, just because there’s a convention to make pools 25y/m doesn’t mean we always have to swim that far without stopping. I stop in mid-pool regularly when working on an elusive skill or sensation. As I feel it improve, I keep adding one more successful cycle at a time. 15m hotel pools are not so good for lap swimming, but they’re perfect for refining subtle skills. As is extended practice of the more basic drills. Learn Superman Glide, Superman Flutter, Laser Lead Flutter, Laser Lead Rotation and other basic balance drills – and get more advice on practice – in Lessons 1 and 2 of the Self-Coached Workshop DVD. hey dude, what are some ‘more basic drills’ as regards butterfly? The 3-step “Mini-Fly” sequence on the BetterFly for Every Body DVD would be a good example. Thank you for this kind article. I will try, tomorrow morning. I have “Basic Freestyle” and have tried to find this kind of balance for years, but haven’t! I am 6′ 1″ and 165 lbs. so floating is difficult and my legs are very “heavy” in the water. Is this possible for my bodytype? Thanks for all your great info/videos! Craig Is the “Basic Freestyle” to which you refer a video or DVD? When you say you’re 6-1 and 165 and so floating is difficult I don’t understand, because many elite swimmers have similar body type. Please don’t confuse “balance” with “floating.” The human body is intended to sink to some extent – i.e. only 5% of body mass will typically be above the surface. Balance means to ‘sink in a horizontal position.” It’s a skill acquired by specific changes in head and limb position and redistribution of body weight. The video I referred to is actually “Easy Freestyle” (my bad). I have tried everything to achieve the “Superman glide”, but still end up with my feet about 3 feet under water as soon as my forward speed is lost. If I blow out my air then I will sink level, but go straight to the bottom of the pool? I can’t find leverage to keep my chest down and legs up? Thanks. Mine sink too . . . at some point. Start stroking while you still have a bit of momentum. Start with 3 to 5 and just one thought. Yes! Finally someone writes about fear of calling.